From Bridgeport: From 395 N, take a left turn on HWY 182. Drive 3.8 miles and look for the signs for Masonic Rd. Turn right and start up the road. The Trap fields are located to the left and the new rifle and pistol range is on the right of Masonic Rd. From the South: While on 395 S, head straight onto HWY 182. Drive 3.8 miles and look for the signs for Masonic Rd. Turn right and start up the road. 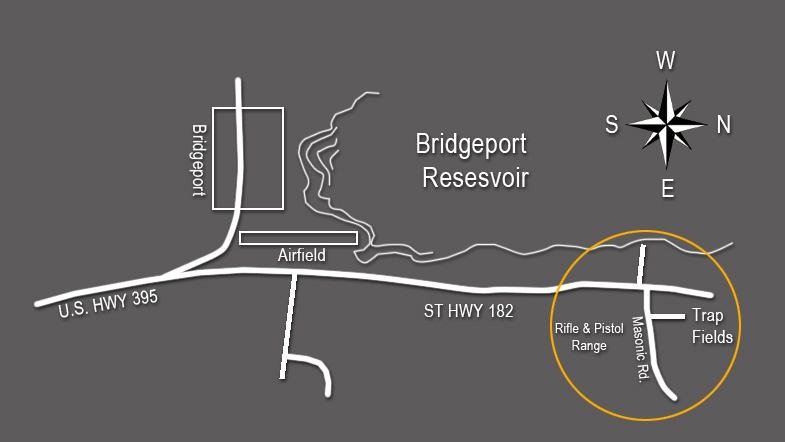 The Trap fields are located to the left and the new rifle and pistol range is on the right of Masonic Rd.